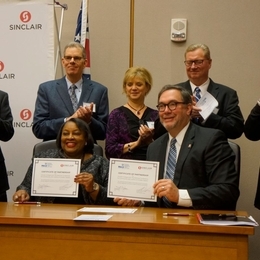 A new partnership between Sinclair College and the National Conference for Community and Justice (NCCJ) of Greater Dayton aims to help organizations and businesses succeed by developing and offering learning engagements designed to improve recruitment, reach a wider customer base, and promote a culture of workplace inclusion among employees. Studies have shown that businesses that embrace and implement a culture of inclusion and diversity have a higher ability to secure top talent, eventually leading to financial returns that are well above national averages. These businesses are able to recruit and retain their workforce more effectively, and are more successful in growing their customer base. New training programs from Sinclair and NCCJ will help area businesses to examine their own workplace needs and provide resources necessary for creating and benefitting from a culture of inclusion. The collaboration will open pathways for Sinclair and NCCJ to focus on programs and courses accredited through the International Association for Continuing Education and Training (IACET). Sinclair is accredited through IACET to provide Continuing Education Units (CEUs) for the successful completion of approved training programs. Two IACET accredited programs, Diversity Skills for Today’s Workplace and Multicultural Communications, have already been approved for scheduling. Sinclair and NCCJ will be hosting a free breakfast briefing examining the vital role inclusion plays in today’s high-performing organizations on Tuesday, February 14, at the Sinclair Conference Center. To register, email workforcedevelopment@sinclair.edu. Pictured are members of the Sinclair Board of Trustees and NCCJ Board of Directors: (back row) Chris Hopper, Bruce Feldman, Beth Whelly, Mark Heitkamp and Barbara Johnson. (front row) Mary Tyer, NCCJ Executive Director and Steven Johnson, president, Sinclair College.